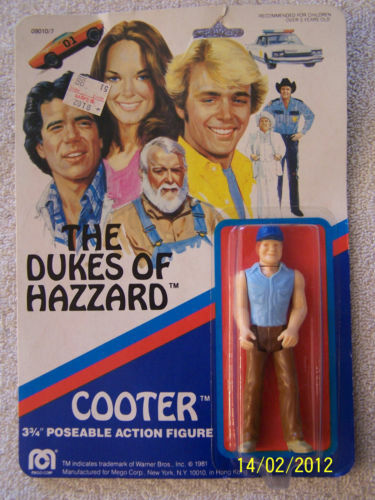 The Dukes of Hazzard was one of the last lines of action figures that Mego produced, and it was one of their most popular, surprising many retailers who reported a shortage of them during the first year of its release. 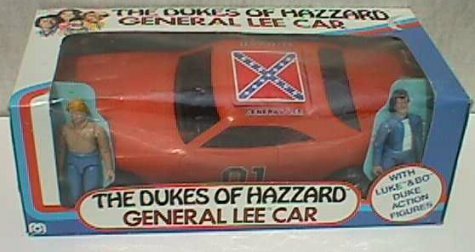 Initially released in 1981 the 8-inch line of Dukes of Hazzard consisted of only 4 figures: Luke, Bo, Daisy and Hog, but there were several variations of them and also there was never a General Lee produced for the 8-inch line whereas there were several vehicles available for the 3.5-inch line. 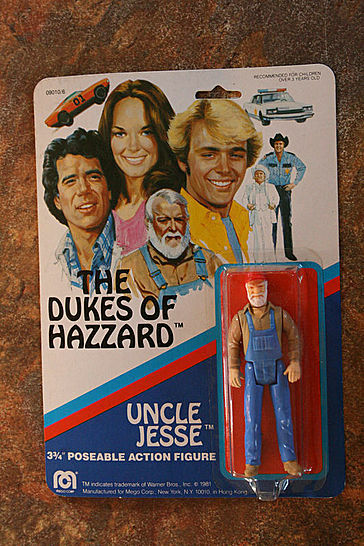 The figures were all blister packed with excellent artwork from the show which also featured Jesse and Rosco who weren’t even produced for the line. The reverse of the backing cards was the same on all the figures with no character specific information. There were 2 variations of the card though, the initial card which was dated 1980 with shorter copyright text and the second with longer text dated 1981. 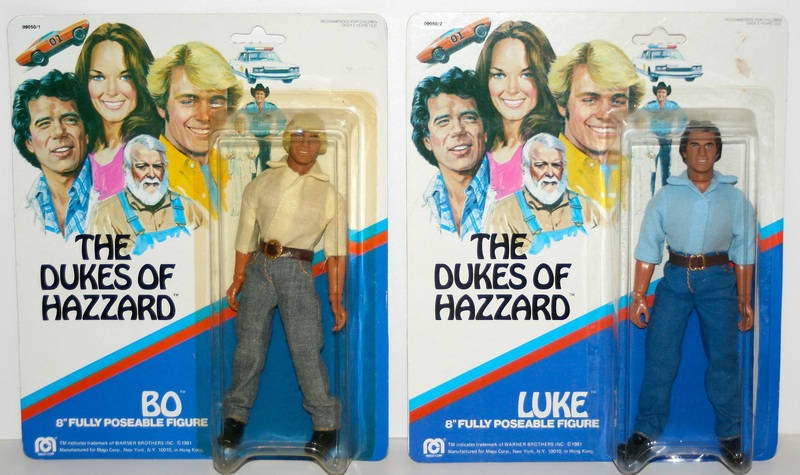 Both the Bo and Luke figures were initially released with long sleeved shirts but these were later replaced with short sleeved shirts, whether to cut costs or to allow more flexibility on the arm joints is not clear. As well as the change in the shirts the denim type material for Bo’s jeans was also changed as was the material for the shirts. 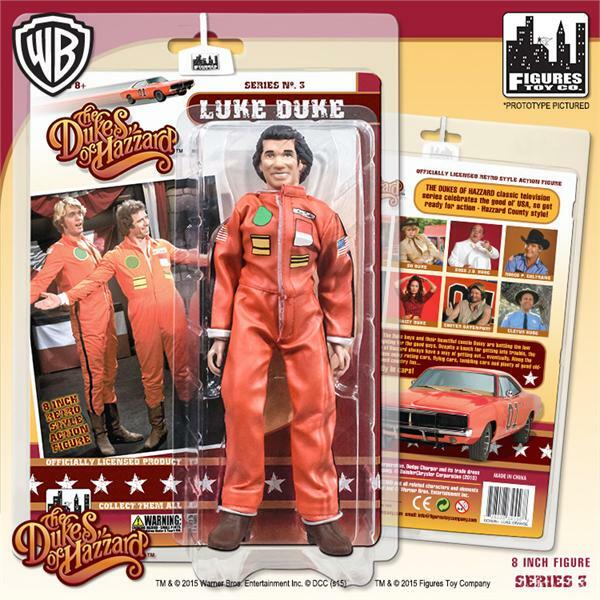 The Luke figure, however remained the same except for the shirt being changed to a short-sleeved shirt. Both of the figures were produced with both the long and short sleeved shirts and on both variations of the backing cards. 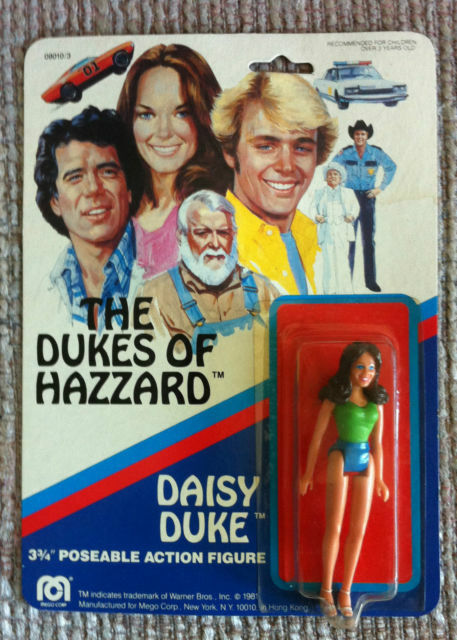 There were also two variations of the Daisy figure produced. 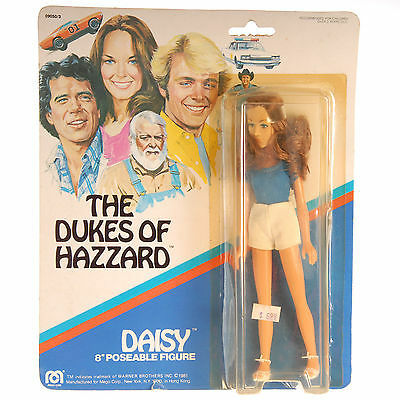 The first and far rarer was released with daisy wearing a green t-shirt and blue denim style shorts with white sandals, but this was quickly changed to a blue t-shirt and white shorts, probably to match the Daisy on the packaging. The Daisy figure was also, unlike the others, only produced on the later style female body that had no articulation on the waist, elbows and knees. 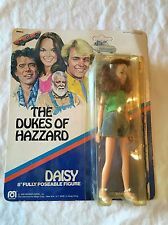 The Daisy figures head was also poorly sculpted, bearing little resemblance to the actress, Catherine Bach, and look a bit big for the body. 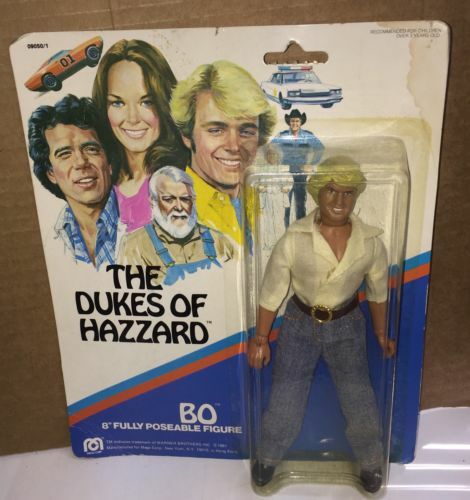 At one point, the two main actors, who played Bo and Luke Duke, left the Dukes of Hazzard show after a disagreement over merchandising but soon return once the dispute was settled. 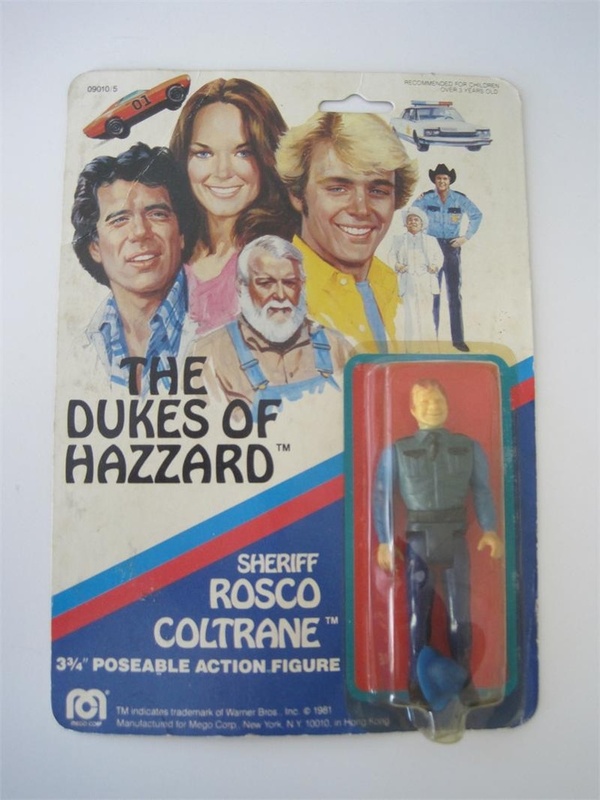 However, during this period Mego changed the head sculpts to reflect the change in actors but instead of repackaging the figures they were packed on the Bo and Luke cards, even the names were left the same. 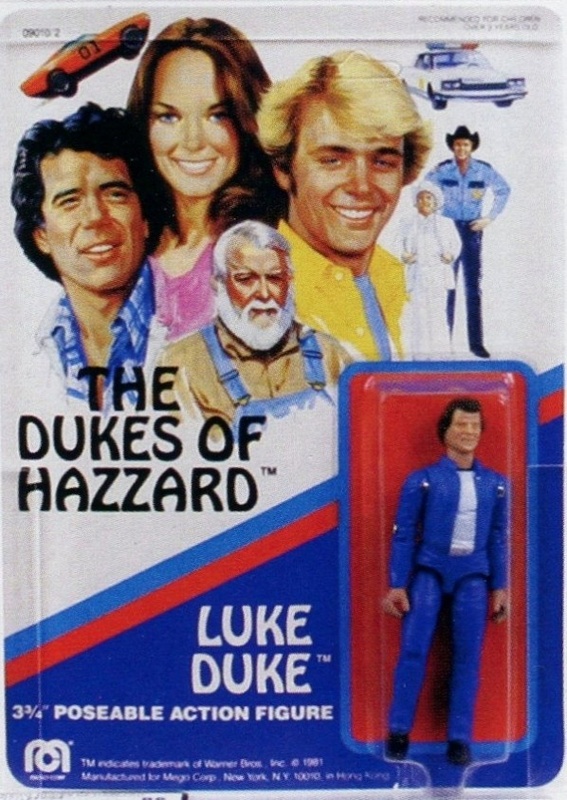 Interestingly enough, small stickers bearing the names Coy and Vance were produced to cover Bo and Luke’s names on the packaging for the 3.5 inch figures. 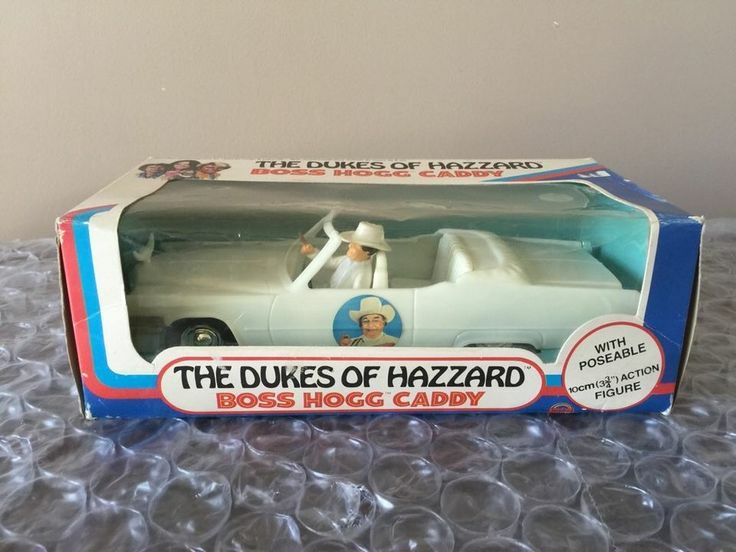 The fourth and last figure in the 8-inch line of Dukes of Hazzard figures was the Boss Hog figure. 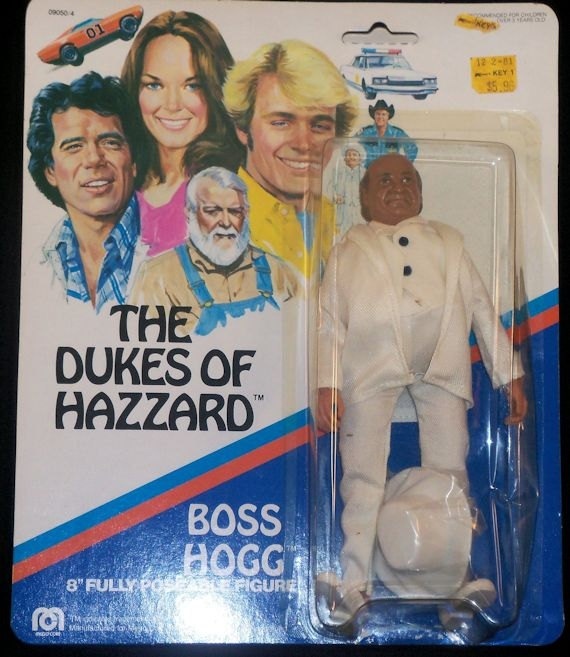 This is the most common of the Dukes figures and was produced with Hog wearing his white suit and vest on the pot-bellied type figure that was also used for the Penguin, Mr Mxyztik and the Wizard from the Wizard of Oz. The head skulpt on this figure was also very accurate and well made. Many think that it was a late addition to the line with the fact that it was only produced on a 1981 backing card seeming to verify this. 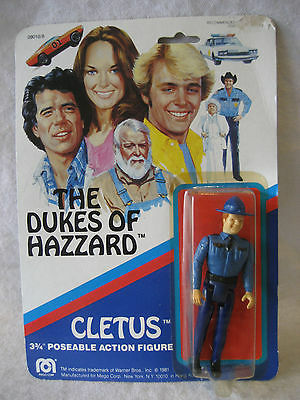 By the late 1970’s most of the toy manufacturers were producing 3-inch action figures as standard so Mego decided to release a 3.5-inch line of the Dukes action figures as well as the 8-inch figures and they proved to be so successful that 2 series were released totaling 12 figures along with several vehicles and even a playset. 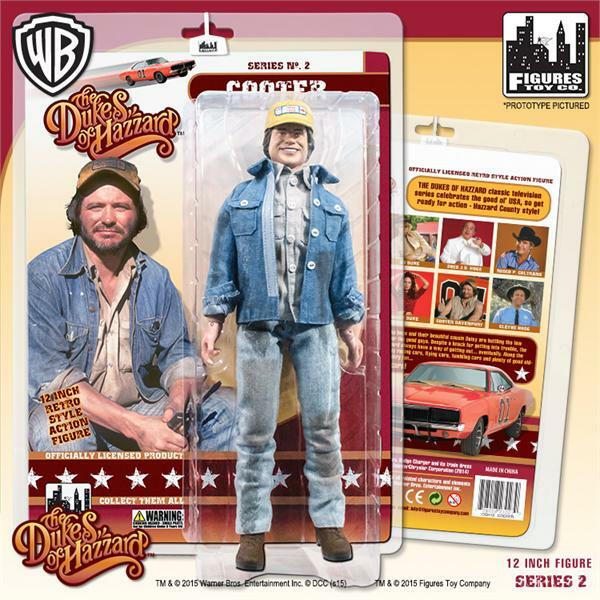 The 3.5 Coy and Vance figures are easily the rarest of these with the Vance figure seemingly produced in even smaller quantities than the Coy figure. 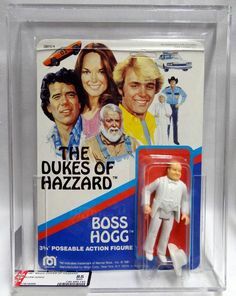 The 3.5 line was also a bit of a mix-match of body types with no real standard but bits taken from several other Mego lines. 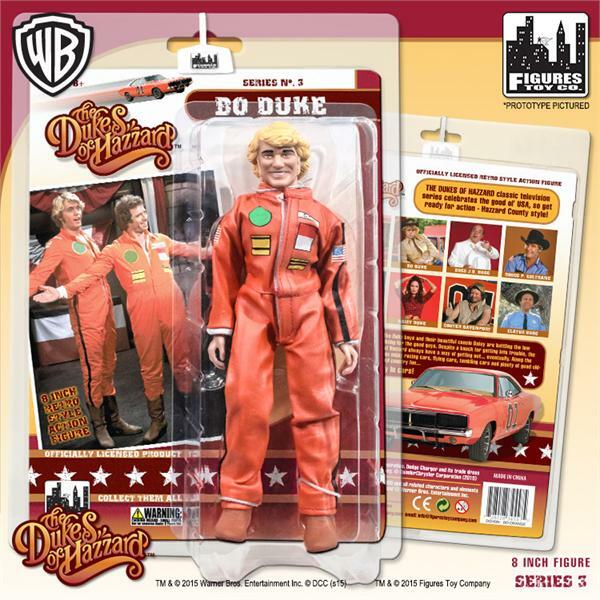 Despite these figures popularity none of the vehicles were included in the 8-inch line and most of the figures remained exclusive to the 3.5-inch line. 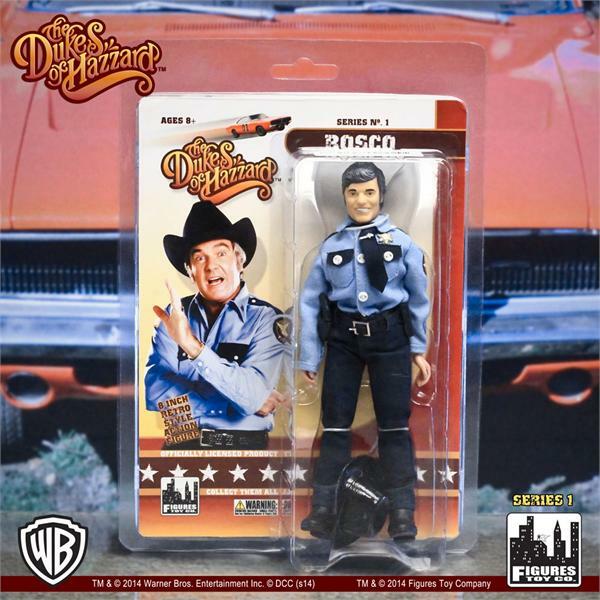 Do you have this (these) figure(s)? Then please send me a photo to share it with other collectors. 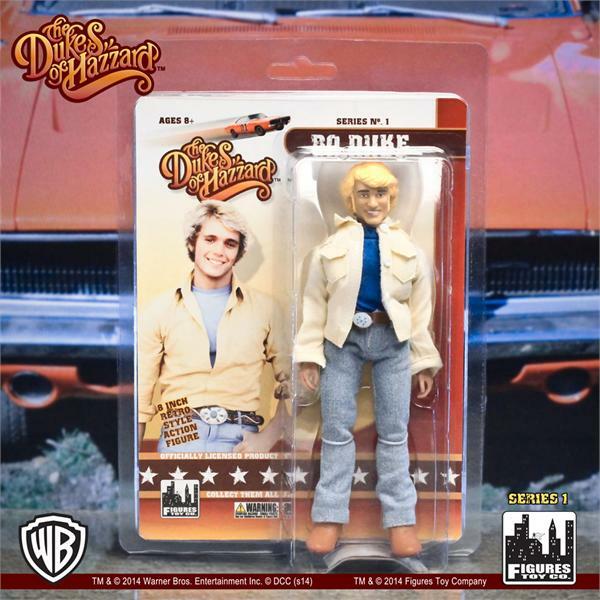 Twelve long years after Mego released the last of their last Dukes of Hazard action figures the Figures Toy Co announced they were going to release a line of retro style Dukes of Hazzard Action Figures. To be perfectly honest with you I am not a fan of these retro style figures as most of them seem to be cheaply made with very poor quality and bear little resemblance to the originals, however they seem to be popular and filling a niche in the market. 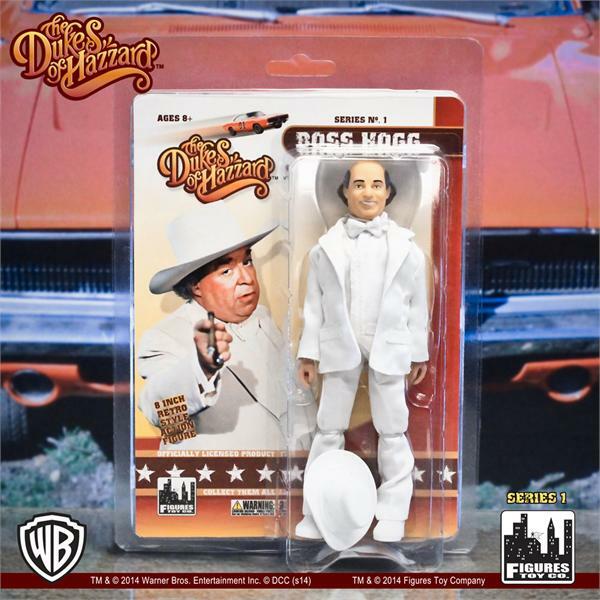 Series 1 was released in March of 2014, which included Bo & Luke Duke, Rosco & Boss Hogg in both 8 inch & 12 inch versions packaged in collector friendly re-sealable plastic clamshell. 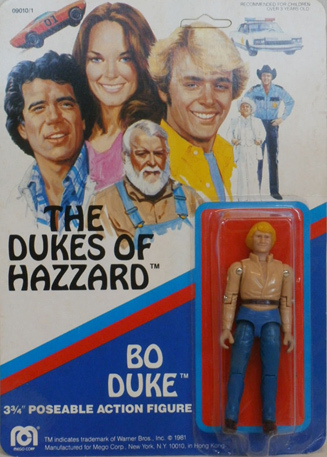 Bo Duke features brown shoes, blue jeans, authentic belt buckle, blue undershirt & yellow jacket similar to the Mego figure. 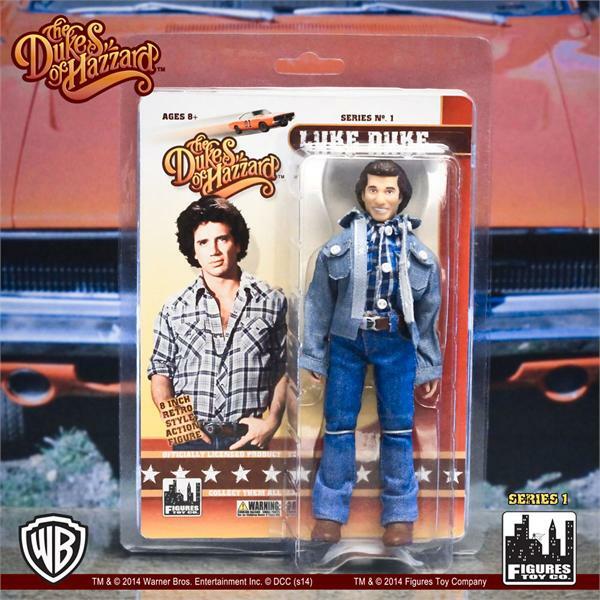 Luke Duke has brown shoes, blue jeans, authentic belt buckle & denim jacket. 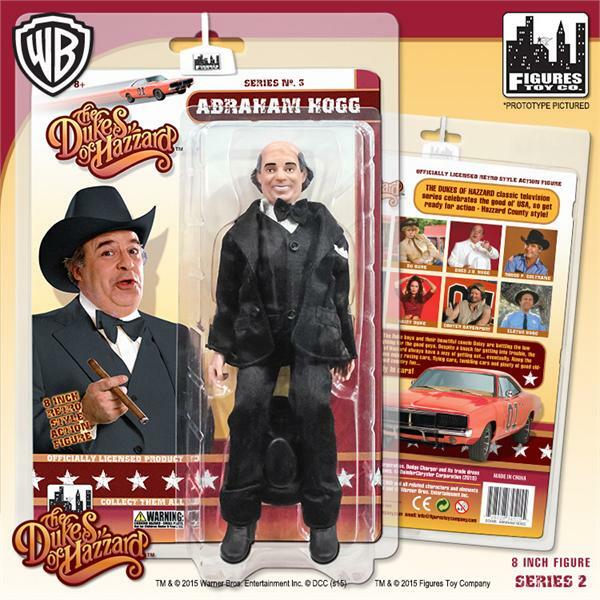 Boss Hogg is wearing a solid white suit along with matching white cowboy hat and last, but not least, Roscoe P. Coltrane features black boots, blue jeans, long sleeved light blue shirt and tie (with police badge and tie clip), black cowboy hat, as well as a utility belt with gun and glasses holder. Unlike like the original Mego line the backing cards for ther clamshells on these figures featured some excellent photos from the series with the reverse of the backing-cards featuring pictures of all the figures available. 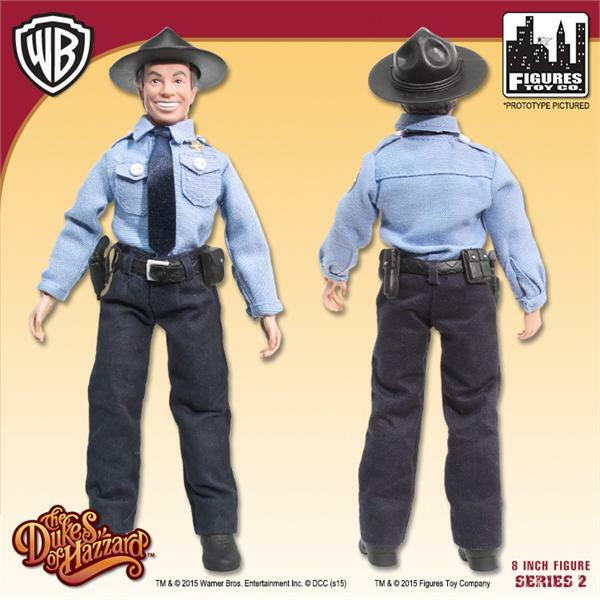 However, as is the case with most of this figures, the sculpting is very poor and the resemblance to the characters and actors, although not non-existent, are very poor as is the quality of the clothes.